Sunday, February 1st, saw the biggest snow fall so far in the Chicago area. The foot of snow—at least!—left us hoping it will be the biggest of 2015. This winter does not seem—seem—that it will be as brutal as 2014′s, but no one’s saying that out loud yet. It was my turn to preach at Friendship United Methodist Church in Bolingbrook, IL, our pastor Rev. Kyunhae Anna Shin having asked me to preach on “What is in your hand?”—the question God asks Moses as he prepares to say to Pharoah, “Let My People Go.” The snow and impending blizzard kept many away, but I’ve spoken and played to smaller crowds! I may post some text of the sermon later, if I can remember it, but thought I would just comment on one experience I had while preparing to speak: I realized most of my notes were simply lists of people, especially those who have helped me as I lead Core Group One or coordinate our church’s mission to the Daybreak Homeless Shelter in Joliet. I thought at first I would just read them from the pulpit, but—not wanting to sound like some awardee thanking an endless list of people—I decided I’d put them in more permanent form here, focusing just on our Daybreak Shelter mission for now. First of all, thanks to Deji Sanyaolu, our main breakfast cook. He and Ann Marie Villacorta are my mainstays for that early, early, 5:00 a.m. shift on Saturday mornings. On Friday evenings I’m almost always joined by Efren Ramos and Bill Tarbell, who know the drill so well they could easily run everything, and often do. Stacey Caudill often shows up with her girls: Haley, Elise, and Aubrey. And Jeff Thoreson with daughter Brittany, whose opinions often spark great conversation. Dawn Callahan brings son Joe, whose sense of humor I always enjoy. Amy and Greg Hanna are recent regulars. Amy usually winds up holding one of the shelter’s kids. “A kid magnet,” Greg says, smiling. Other young people have come, like Efren’s son Anthony, and Kumi Olatunde, who came with Joe Callahan this past January. Youth in various confirmation classes come, which also means a big thank you to those who bring them, like Pastor Anna, Tom Marsh, Melissa Schoonover. I also look forward to the Boy Scouts and John McWilliams, whose better half, Donna McWilliams, will be bringing some of her Girl Scouts soon. My Filipino compatriots like Joy Bernardo, the Corpuz family, the Valdez Family. I know I must be leaving people out, but go easy on me! Please let me know if I’ve inadvertently left you out, and I’ll make up for it somehow. I could name lots of youth, but you can at least see many of them on this video Here. (The picture above also shows some of those youth.) The video also shows members from an entire Core Group who came down once. Our whole choir has come for two Christmases in a row now (thanks, Pam Stephan—who has also come down to help without the choir). Then there are all who contribute food regularly. Margaret Hicks is always there with one of our breakfast mainstays. Once we talked about her retiring, and I said, “But who’s going to step up and bring the hash browns every month! ?” When we first came to Friendship Church, Daybreak was probably the first thing I got involved in, and I got to know so many people calling them about their Daybreak contributions. I remember especially having long talks with Dave Hargett, and Jody Hargett continues to give month after month. As do so many: Paquettes, DeWitts, Shirley Eatwell, Sharon Hall, Kathy Campbell, Kathy Bulman, Julie Verson, Dena Byrd, Audrey Arowolo, Susan Higginbotham—who bought us four large boxes of pizzas recently. Leonard and Carolyn Jones, Audrey and Paul Miculsik, Chris Mader and Tim Leith. Carolyn Weber, Jim Steadman, Jane Pierce, Sam Mends, Fern Deatrick, the Lichtys, Lorna Tumamayo. And welcome to the team, Deborah Marion, our newest contributor. What do you have in your hand? I have a lot of helping hands. Part of my sermon urged us to think about Moses having less in his hand than we do now. ”What is in your hand?” God asks him when Moses says, “Why would Pharoah listen to me?” His staff was in his hand. He threw it down as God commanded, and it became a serpent, which turned into a staff again when he picked it up (Exodus 4: 1-5). We tend to think of this staff and this moment as super powerful things—which of course they are in certain ways. But not every way. And not really, in the long run, as powerful as many hands serving together. ♦ See the Daybreak Service Schedule and feel free to join us. 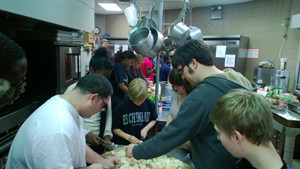 ♦ Learn more about Emmanuel House, Chicago Family Directions, and Feed My Starving Children, three organizations working on issues of hunger, education, and housing. And read about the crisis of Growing Inequality in America. ♦ Learn about famed homeless advocate Diane Nilan. Thirty years ago she started what would become the Daybreak shelter. This entry was posted in Faith, Social Change and tagged Chicago Family Directions, Daybreak Shelter, Diane Nilan, Emmanuel House, Feed My Starving Children, Friendship United Methodist Church, Hear Us, homelessness and inequality. Bookmark the permalink.